Today is all about the special women in my life - the one who raised me up unselfishly and the one who approved my promotion to the rank of Dad. But rather than me penning tribute after tribute to my wife year after year, I thought it would be something special if I got the boys to write something in appreciation for their mother instead. Well, there is nothing quite like outsourcing my blog work too... but the boys need not know that. And it sure helped that the boys did not need any persuasion to pen their tributes. "Thank you for taking care of me, cooking stew, washing the dishes, giving me presents on my birthday and Christmas, your unconditional love... your unwavering support to me all these years. Thank you for your kindness, and your precious time to spent with me for my exam. And you work util 10.00pm to earn money to eat, spend money on electricity bill and water bill. Tank you for taking care of me for 9 years." "Dear Mummy, thank you for taking care of me, cooking delicious food for me, helping me to control my anger, giving presents to me on my birthday and Christmas and all the things for me. You are a very loving, kind and beautiful mother. You are definitely the best mother ever! 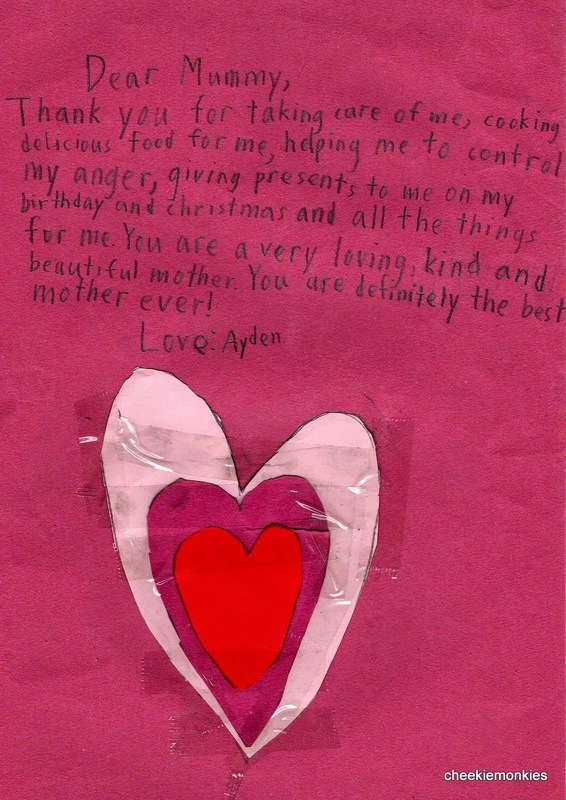 Love, Ayden"
I have to admit I felt incredibly touched when I read those words. Ditto for the wifey, who struggled to contain her tears after she read those paragraphs. Ayd even upped the ante by giving the wifey a $12 angpow! He said it was to "reward Mummy for her kindness". 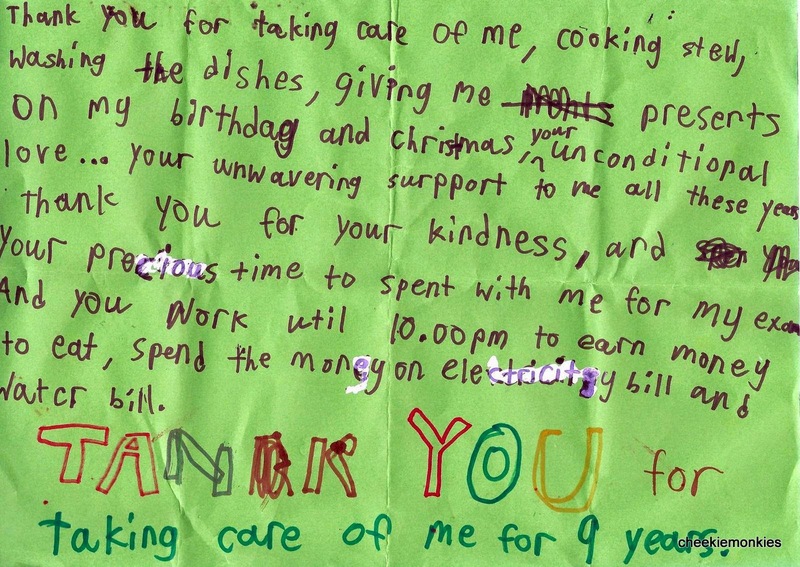 Considering that he is one stingy miser when it comes to his personal savings, his gesture totally caught us by surprise, in a warm fuzzy kind of way. Ale was not to be outdone though. 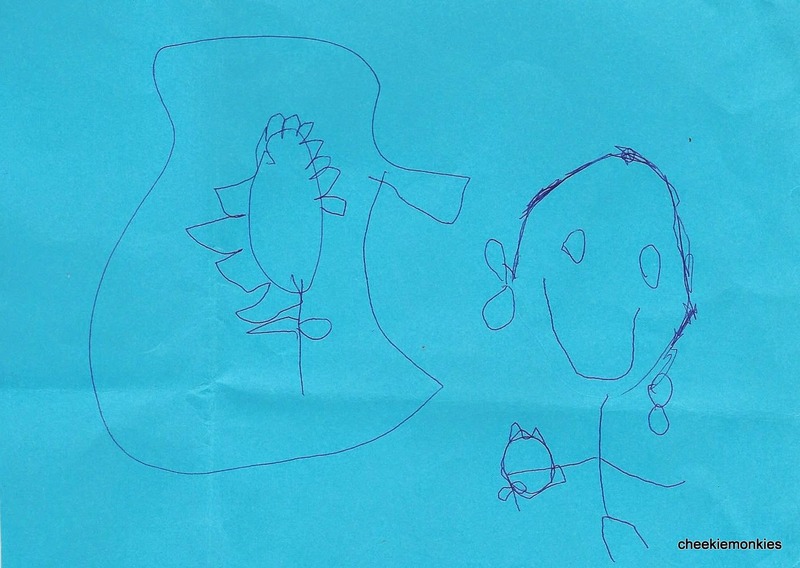 She too drew something entirely on her own - a portrait of her Mummy, with matching earrings to boot. To the wifey, thank you for the blood, sweat and tears that I never see. Thank you, for just being you.